Order "The Last Economic Superpower" here. It will take every ounce of global leadership and courage to reincarnate globalization with non-American characteristics. In the world of the future, there is no mistaking the fact that global power and influence will be more diffused among nations and regions, making it more challenging to coordinate and craft solutions to pressing global problems. For over a half-century, the rest of the world followed America's lead until the United States drove the entire world economy over the cliff in 2008. The world will never so blindly follow again. The reincarnation of globalization requires that many things go right: that America refortifies its underlying economic strengths and regains its confidence when dealing with a more complex and diverse world, that China shifts its economic growth model away from exports and toward more personal consumption, that multilateral institutions — notably the G20 — succeed in guiding the world economy toward more equitable economic growth, and that the West comes together and confidently forges a more productive relationship with the Rest (as opposed to drifting apart). All of the above represents a tall order — and, of course, must be accomplished in conjunction with other main actors on the global stage: India, Russia, Turkey, South Africa, Brazil and China, to name just a few. It will take every ounce of global leadership and courage to reincarnate globalization with non-American characteristics. For this to happen, it is critical that all key parties come to realize that, yes, this time is different. The financial crisis of 2008 unleashed a seismic shift in the global economy. Free-market capitalism will survive — but not in the unregulated and anything-goes environment of the past quarter century. The participation of the state in both the developed and developing economies is bound to become larger, not smaller. Around the world, the commanding heights have shifted from the private sector to the public sector. Regulated more at home and abroad, the ability of banks and nonbanks to push capital any place in the world at virtually any time is becoming more restrictive. It is the deglobalization of finance that threatens to unwind globalization as we know it. 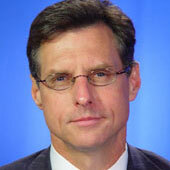 The relative economic decline of the developed nations, the rising influence of the emerging markets in general and China in particular, the proliferation of regional trading blocs — these seminal trends were fast-forwarded by the crisis and have, in turn, accelerated the move toward a less U.S.-centric, more multipolar world. In the world of the future, there is no mistaking the fact that global power and influence will be more diffused among nations and regions, making it more challenging to coordinate and craft solutions to pressing global problems. The new era will require far-reaching adjustments for those nations in decline and for those on the ascent. China remains coy and conflicted by its new global status, acting more like a reluctant stakeholder in the global economy as opposed to a willing leader. The developing nations in general are an incredibly heterogeneous bunch and may prove unable and incapable of leading the global economy forward. Becoming more acclimated to a new multipolar world will be a notable and significant challenge to the world’s last economic superpower — the United States. While America is expected to remain one of the most powerful nations in the world, its status as an economic superpower has been undermined by the “Made in America” global financial crisis, as well as by its profligate ways well before the crisis struck. It is different this time for the United States. When America speaks today, the world is less inclined to listen, let alone jump to the tune of the United States. At the end of World War II, the United States largely dictated the global economic rules of the game to the rest of the world, which, with little resistance, accepted the American way of doing things. For over a half-century, the rest of the world followed America’s lead until the United States drove the entire world economy over the cliff in 2008. The world will never so blindly follow the United States again. To this point, in most developing nations the standard economic medicine of the West is no longer accepted. There are alternatives, in other words, to the IMF and the Washington Consensus. Beijing has plenty of capital, as do other regional players like Middle East sovereign wealth funds, Russia and Brazil. Today, when a developing nation finds itself in financial trouble, there are ways of working through the crisis other than humbly going hat-in-hand to Washington. Western multinationals no longer rule the world and now confront serious competitive challenges from emergent corporations in China, India, Russia and other nations. While still one of the largest economies in the world, the U.S. economy has never been more dependent on foreign natural resources, foreign capital and foreign labor. Under current circumstances, the United States is rapidly losing control of its own economic fate. Since there is no turning back, the world’s last economic superpower would do well to heed its own advice. On the first page of the State Department’s National Security Strategy report, released in May 2010, the opening paragraph states: “To succeed, we must face the world as it is.” No ten words better underscore the challenge. The world is messy and complicated, to be sure, but also brimming with opportunities for the United States and the world at large. The paths before us — an economic cold war or globalization reincarnated — could not be more different. With a little luck and massive doses of leadership, the multipolar world unfolding before us could be the start of another golden era of globalization, bringing success to all nations. 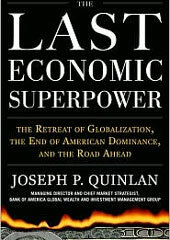 Editor’s Note: This feature is excerpted from THE LAST ECONOMIC SUPERPOWER by Joseph P. Quinlan. Copyright 2011 by Joseph P. Quinlan. Reprinted with permission of the author.